CHICAGO – More than 300 Communist Party USA members joined the picket line of UNITE HERE Local 1 at the Congress Hotel on July 2. The workers have been forced on strike for the last two years. Jose Gomez, one of the strikers, told the World he has worked for the hotel for five years and still he has no benefits. The hotel pay scale is 30 percent lower than other Chicago hotels. Congress Hotel management wants to cut that another 7 percent. The hotel is offering $8.21 an hour, whereas all the other hotels pay $11.40 for the same work. 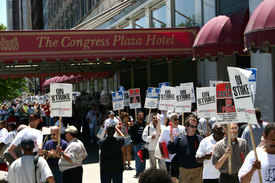 The picket line action was held as part of the CPUSA 28th National Convention here. The picket line was loud and lively. Participants shouted like “2,4,6,8 help us negotiate!” “No Justice, No Peace!” and carried picket signs. Participants were a diverse group – multi-racial, multi-ethnic and spanned the generations. One mom pushed a baby carriage, while another father marched with his teenagers and eleven year old. From Hawaii to Missouri from Georgia to Maine, convention delegates from all over the U.S. pledged their support to the workers. Lance Cohn, a retired teacher and leader of the Illinois Communist Party, said the CPUSA has been part of the strike support for over two years. He said visiting the picket line was important to show the party’s solidarity with the striking workers. Lars Negstad, a union organizer told the World, “the hotel used to pay wages on a par with other hotels.” He said that the hotel’s “final offer is to cut wages, slash benefits and contract out work” to non-union members. As a result, the workers have been on strike since June 15, 2003. Negstad said the owner of the hotel owns garment factories in the Philippines. UNITE HERE has put pressure on some of the owner’s main customers such as Liz Claiborne and Frederick’s of Hollywood and they have stopped doing business with him. Negstad said there is a proposed bill before the city’s City Council to notify potential hotel customers about the strike before they arrive. He asked for support for this “right to know” bill. When asked how he felt about the Communist Party supporting the picket line, Negsted exclaimed enthusiastically “Its great! They are good allies and have supported the picket line consistently from the beginning. Anyone who supports the worker’s struggle is our friend.” He added that the CPUSA presence made the strike a very visible event since there were one million people attending the “Taste of Chicago” festival in Grant Park just across the street.